As shown before sharp phaseouts of deductions may introduce the annoying problem of your tax income decreasing even as your before tax income increases. The solution to that problem is to define a smooth instead of a sharp transition. The simplest method and the one chosen by the IRS is to linearly spread the phaseout, i.e. the deduction decreases linearly until 0 above the phaseout boundary. The previous example can be reworked, showing three different linear transition slopes. As shown in the figure, a smooth transition makes the curve continuous, but it is still possible for the income after tax to be locally decreasing, depending on how fast the deduction is phaseout. This is illustrated by the red dashed curve in the figure. There are two ways to define a linear transition phaseout, either fixing the slope of the phaseout, or fixing the end point of the transition. The two methods are equivalent when the deduction amount is fixed, like for the tuition fee example, but they are not equivalent when the deduction amount is a variable dependent on one's situation. In that case, fixing the slope is better because the slope is directly related to the increase in marginal rate. 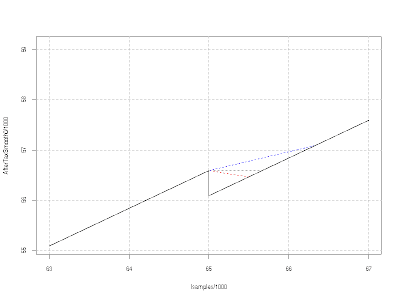 Fixing the slope insures that the change in marginal rate is also fixed. This is probably why this is the form universally selected by the IRS when it defines smooth phaseouts. The IRS always uses similar text to describe the transition. The example below is taken from Publication 17 (2006): "If your itemized deductions are subject to the limit, the total of all your itemized deductions is reduced by ... some details removed at this time ... 3% of the amount by which your AGI exceeds $150,500 ($75,250 if married filing separately)." This shows that controlling the slope as specified results in a predictable increase of the marginal rate. It is then a simple matter to specify the slope such that the phaseout doesn't introduce unwelcome effects, especially limiting the increased marginal rate in the transition region to (well) below 100%. An other problem introduced by sharp boundary phaseout is linked to an other desirable property of the tax equation that was not stated yet: the income after tax should be a monotously increasing function of the income before tax. In simple terms, an increase in your income before taxes should always result in an increase of your income after taxes. Mathematically this means that the marginal tax rate must be smaller than 1 everywhere, and this is clearly not the case at a sharp phaseout boundary. If income is defined as a continuous variable, the marginal rate is infinite, i.e. there is a positive impulse in the marginal rate at the position of the boundary. Income is of course quantized, and the marginal rate in that case is always finite, but significantly greater than one. In the example discussed in the previous article, the marginal rate was $500 in tax increase divided by $10 of income increase = 50 or 5,000%. We can visualize that using a graph showing the income after tax in function of the income before tax, based on the characteristics of the fee deduction for an individual filer. 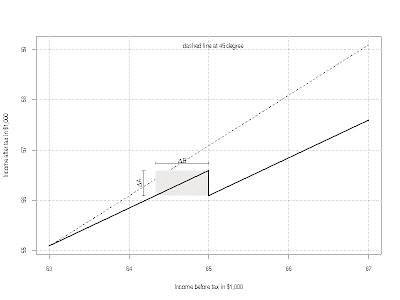 The sharp phaseout boundary introduces a negative step into the curve, the highlighted areas correspond to ranges of income where an increase in income before tax can result in a decrease of income after tax as shown below. The vertical step is simply the difference in deduction times the underlying marginal rate. 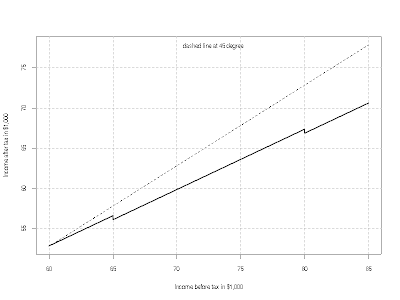 The range of income affected is the vertical step divided by the slope, and the slope is 1 minus the underlying marginal rate. For the example, the vertical step is $2000 * 0.25 = $500, and the affected range $500 / ( 1 - 0.25) = $667. Of course, the problem is only apparent when looking closely, when looking at a scale much larger than the range calculated above, the bumps in the curve become much less significant, but still present and somehow disturbing. In the next article we'll see how to avoid these ugly steps, providing a rationale for the solution favored by the IRS. Phaseout is the process of decreasing some tax benefits, usually based on an increase in income. This can take the form of reducing the amount of a specific deduction, or to decrease some tax credit. Phaseouts can take different form, the simplest form is a sharp boundary: if your income exceeds a threshold, then some deduction or credit is no more allowed. This form of phaseout is easy to describe and understand but has unwelcome consequences: it introduces a discontinuity in the tax equation. Most of the phaseouts defined by the IRS have a more elegant form that will examine in a future article, but unfortunately a few sharp boundaries do exist in the tax code. If your modified adjusted gross income (MAGI) is not more than $65,000 ($130,000 if you are married filing jointly), your maximum tuition and fees deduction is $4,000. If your MAGI is larger than $65,000 ($130,000), but is not more than $80,000 ($160,000 if you are married filing jointly), your maximum deduction is $2,000. No tuition and fees deduction is allowed if your MAGI is larger than $80,000 ($160,000). So the phaseout has two sharp boundaries that depend on your filing status. If you cross a boundary, the deduction may decrease by $2,000, as it happened to John. The increase in tax liability is the $2,000 step multiplied by the marginal tax rate, 25% for incomes close to the boundary. So John may have reasons to curse who wrote that tax provision, but calling the customer support for the tax preparation software will be fruitless. So the $10 increase in John's income can result in an increase of about $500 in tax liability. That increase can possibly trigger the estimated tax underpayment penalty. Calculating the underpayment penalty is complex, in general you let the IRS figure that out, but it will be a positive value :-). If anybody can provide an estimate for the above scenario, that would be great.